Kitchen Magic – Y is For Home! our little kitchen area. The white cook-stove is powered by wood and warms the house up nicely on cold days! 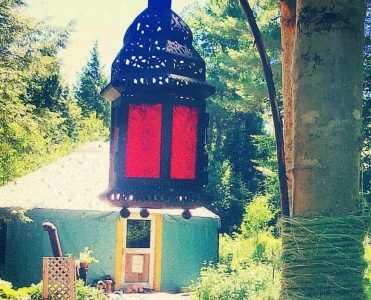 Our yurt is 24′ in diameter, which means it is about 450ish square feet altogether. But yurts are so expansive inside, the dome is about 11′ high and if it isn’t divided up into rooms with walls and doorways, the space feels bigger than it is. When I’m cooking at the stove, it feels like the whole house is kitchen; when I’m writing at the desk, the whole house is a cozy writing den. Most of our cooking is done in the kitchen area. We have a wood-oven for baking and giving a bit of extra heat in the winter! The table doubles as a counter-space and schooling space and painting space..it’s pretty all purpose, actually. Food storage is always a problem, we have the tall white cabinet for canned things and for hiding food from Luba, who loves to steal. We have a large cooler outside behind the house for cool-storage in the summer and the table has a shelf for potatoes, squashes, onions, ginger, and garlic. But we are always shifting things around, especially in the winter, when we stock up on winter stores and wood for cooking. On hot July days it would be awful to heat up the woodstove inside! We’ve started cold-brewing a lot of our morning coffee, and for dinners and big breakfasts, we have the summer cookstove set up just outside the door! Old, and more than a little rusty, this stove was a hand-me-down from a customer of Seth’s. It’s a bit warped on top from a long ago over-heating, but it works wonderfully and gives us an outdoor space to cook, can, or bake! Woodstove cooking can take a long time though, and some days, when we’re rushed or lazy, we light up the little propane cookstove. It has just one burner, and unlike wood, we don’t have an abundant supply of propane growing all around us, so it feels a bit wasteful. But for quick summer meals or late-night popcorn, it’s a great help. Previous Post Welcome to the Yurt!